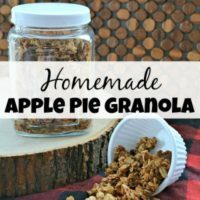 This homemade apple pie granola is very easy to make and makes a delicious breakfast! Preheat the oven to 325 degrees. Cover a baking sheet with aluminum foil or parchment paper. In a bowl, mix the oats, oil, and 1 tsp salt. Spread the mixture on the baking sheet and bake for 15 minutes. If you like extra crunchy granola, bake for 15 minutes, then stir and bake for 10 more minutes. Transfer the oat mixture back to the mixing bowl. Add cinnamon, 1/4 tsp salt, ginger, nutmeg, brown sugar and ½ a cup of the chopped dried apples. Mix well. Add applesauce to the granola and mix well. Pour the granola back onto the baking sheet. Press it down firmly. Drizzle maple syrup over the granola mix. Bake for 1 hour at 300 degrees. It may be finished sooner depending on your oven. Check it at the 30 minute and 45 minute mark. When it’s done it should look golden brown, but not toasted/burnt. Let the granola cool completely, then break apart. Mix in the remaining ½ cup of dried apples and enjoy!